Naturally this long pimple rubber with ITTF homologation (with friction) offers only little spin reversal. Nevertheless it does produce a considerable disruptive effect on account of a completely new and innovative rubber composition which changes the playing characteristics decisively. Both the version without sponge (OX) and the version with sponge (0.6 and 1.0mm) are very effective for chop-blocking close to the table. Also the ball can be blocked passively or aggressively against topspin through a sort of push-blocking technique where the ball is being “pushed down” while holding the bat in a rather closed angle. Furthermore the ball can be kept short over the net for service returns even against fast services with no spin on it at all. The ball bounces very low and even moves backwards to the net. The version with sponge (especially with 0.6mm) enables a more dynamic service returning and thus also provides a good disruptive effect. This also holds true while returning services with a lot of spin since this makes the ball float. Also the ball bounces very low while counter-attacking. On top of that the rubber enables highly disruptive attacking shots through aggressive pushing, lifting and sidespin strokes. Finally DESPERADO is a good choice for chopping too since the ball can be returned very flat with good backspin or alternatively as a float ball. 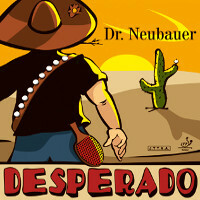 Put pressure on your opponent, play with DESPERADO!